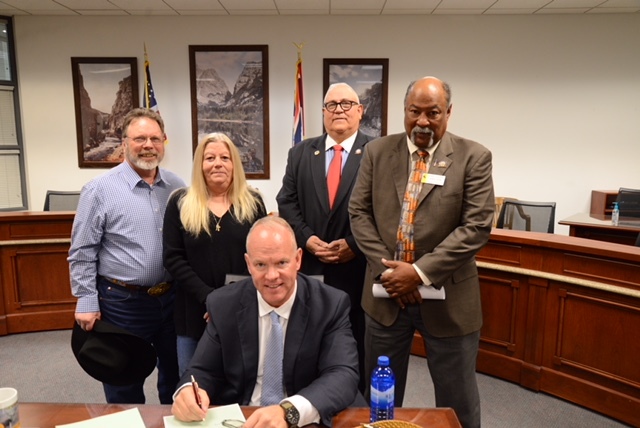 On March 3rd, Governor Matt Mead signed into law a bill which says that natural flare gas that is used to treat produced water is exempt from taxation. The Alliance commends the men and women who worked hard to make this happen. This good first step is one of many that we will take together to change our minds about produced water and how we can make it beneficial use. Left to Right is Marvin Nash, General Manager of Encore Green; Darlene Nash, Owner of Encore Green; Representative Stan Blake; Representative James Byrd. Seated, Governor Matt Mead. House Bill 172, sponsored by Rep. James Byrd, Rep. Stan Blake, Rep. Debbie Bovee, and Rep. Marti Halverson. Newer PostHere's Our Official Launch Press Release! The Future is Now!